Shower of Roses: My Little Cupcake :: Wrapping up the Baby Shower! First of all I want to THANK YOU ALL for participating in this Virtual Baby Shower for Charlotte and her little Cupcake! I had so much fun hosting it here at Shower of Roses, and have been so inspired by everyone's kindness and generosity. In addition to all the prayers and advice, not only did I have enough money to order the crib by the end of the 2nd day of the Shower, all together we have an extra $210.00 to send to help cover any other nursery and baby supplies Charlotte still needs as they prepare to welcome their little blessing! Yesterday afternoon I made the little card pictured above... It's hard to see in the picture, but the embossing reads "Bundle of Joy." 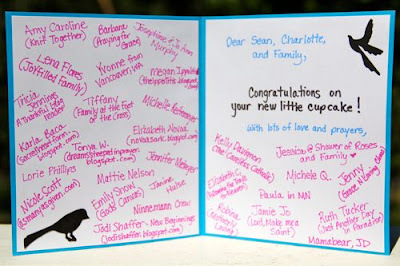 On the inside it says "Congratulations on your new little cupcake!" I signed it with the names/blogs of all the women that contributed towards the crib, and thought I would post a picture so you could all see how it looks. Thank you all again! Now for the rest of the prizes!! I am so glad that I decided to have Sunshine and Shortcake choose the winner of the Cupcake Decorating Contest! I don't know how I would have ever been able to choose, they were all SO CUTE! We thought all of the cupcakes were really cute! Miss Margaret's redecorated cupcakes were very creative. Miss Barbara's looked very fancy and exquisite. We loved Miss Amy's and Miss Kelly's bird themed cupcakes since our little sister's room has lots of birds in it. We thought Miss Lorie's cupcakes were clever the way she turned a vanilla wafer into a baby and baby stroller. We called it a "Candy Pram"! The watermelon cupcakes look really delicious. Maybe mom will let us make some soon! Miss Jessica's really looked like real baby rattles! But we choose Miss Jamie Jo's duckie cupcakes as our favorite. We thought they were sooooo cute and even looked all fuzzy just like little duckies (and babies) should! Thank you all for helping us celebrate our new little sister! Your new cookbook is on it's way! 1. 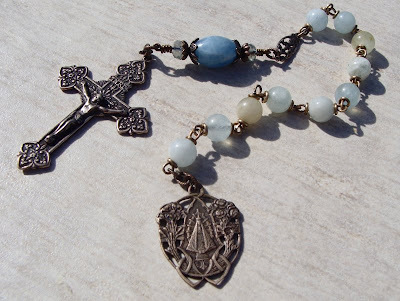 The gorgeous Mary, Flower of Flowers Tenner donated by Anne at Under Her Starry Mantle and All Beautiful Catholic Beads will be going to comment #45, Jo Murphy! 2. The Miraculous Medal Bangle and Bobbles, handmade and donated by Barbara at Praying for Grace and Prayerful Beads will be going to comment #5, Sarah from Amongst Lovely Things! 3. 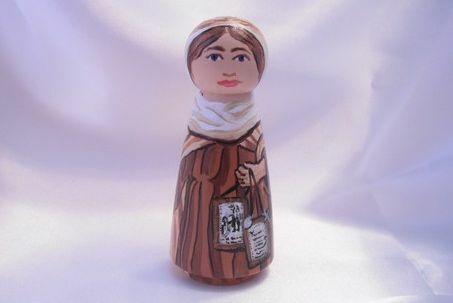 This lovely Our Lady of Mount Carmel Doll donated by St. Luke's Brush will be header to comment #13, Lorie P. a blog follower in Arizona! 4. 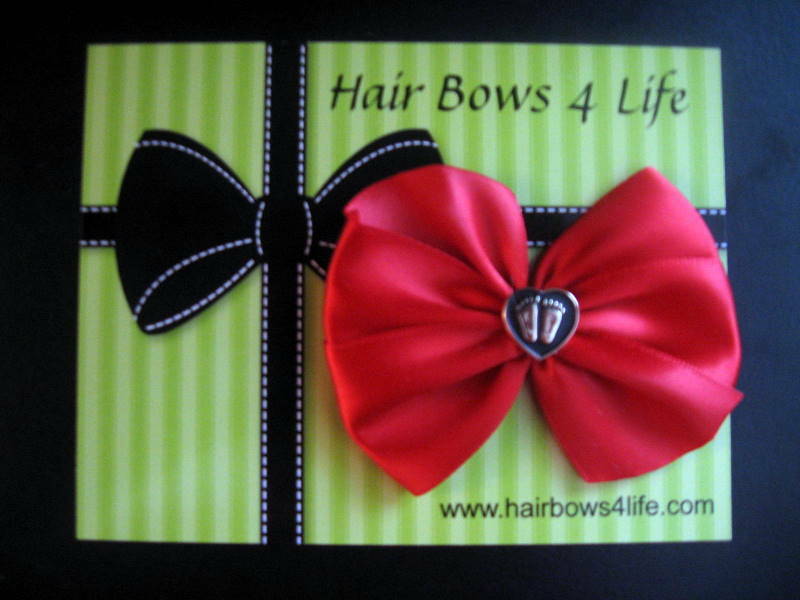 This collection of adorable Hair Bows, donated by Cecilia at Hair Bows 4 Life, will be headed to comment #14, Roxaline at Queen of Angels. They are going to look adorable on her little girls! 5. 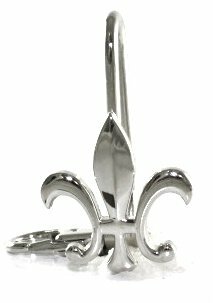 And last of all, this cute little Fleur Di Lis Finders Key Purse Key Hook will be going to comment #30, Erin at Growing with my Girls! If you could all send me your mailing addresses I will get them to the generous Catholic Businesses that donated these great prizes. Please keep them in mind for your future online shopping! I hope you enjoyed your "Baby Shower" Charlotte! You are loved by so many of us here in the blogosphere. God bless you and your sweet family! And thank YOU, Miss Jessica, for hosting this very fun shower. The next time, though, it'll be IRL...okay? The Murphy family have the luck of the Irish LOL!! OH, my!!! I really can't belive I won,(especially since I paired the post with our update on well...you know what) thank you so much!! I thought all the cupcakes were adorable and could not have decided either!! God bless you Charlotte and your sweet kiddos and that sweet little baby!! Jessica, thank you so much for hosting this fun, fun shower!! 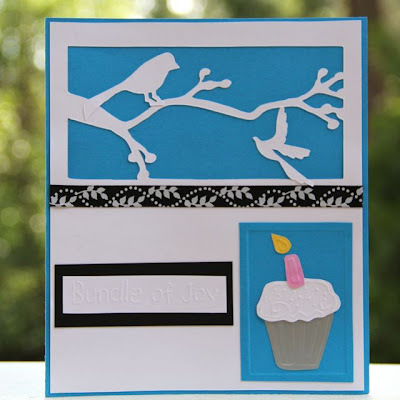 I forgot, Jessica, that card is beautiful--amazing how you matched her baby room theme and cupcake theme in one card, it turned out wonderful, what a beautiful keepsake for Charlotte! this is so nice, i really enjoyed this blog. thanks for sharing.